The Responder Safety Learning Network would like to take a moment to pay tribute to the legacy of Deputy U.S. Fire Administrator Glenn A. Gaines. Chief Gaines lent his expertise, perspective, and time to RSLN through interviews for the Incident Command & Management self-paced program. Chief Gaines was a supporter and champion of safety in response for all agencies. Steve Austin, project manager for ResponderSafety.com, reflected on Gaines' contributions to the fire service, "He was the true definition of a leader — leading by example, being generous with his time and knowledge, and always learning and improving his own practice. His lifetime of dedication to the fire service touched everyone in the profession and will continue to do so for many years to come." Chief Gaines rose through the ranks of Fairfax County Fire and Rescue (VA), serving for 35 years in many positions, including seven years as fire chief. 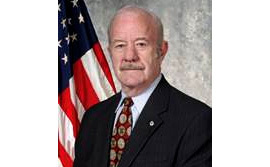 He then was a principle architect of the Assistance to Firefighters Grant (AFG) Program at FEMA/USFA and was the lead in developing the Staffing for Adequate Fire and Emergency Response (SAFER) grant program. These grant programs that Chief Gaines helped found have awarded millions of dollars over the last decade to fire departments and fire-related organizations to purchase equipment, fund training, and support research that makes emergency response safer for everyone. The Responder Safety Learning Network would not exist without the AFG Fire Prevention & Safety grant program. The Responder Safety Learning Network is grateful not only for the funds that Chief Gaines' work made available, but for his leadership that shaped the AFG program, realized the vision, and brought improved safety within reach of every department. The Responder Safety Learning Network extends its deepest sympathy to Chief Gaines' family and colleagues, as well as our profound gratitude for their support of Chief Gaines' work that has meant so much to the practice of emergency response in the United States. We were honored to have known him and benefit from his generosity and lifetime of experience.